Home » Featured » The Wine Wench Goes Green (And Not With Envy)! The Wine Wench Goes Green (And Not With Envy)! A), inferior to non-organic wines; and, B), that they are more expensive. Boy, was I wrong! In 1980, Veronique founded The Organic Wine Company (http://www.theorganicwinecompany.com). Check out her website – it is informative, humorous and the selection of organic wines is really good! I have met with her a couple of times and tasted some of the wonderful organic wines that she is championing – not so much for herself, but for the hard-working vintners around the world who are going against the grain to do what they think is right – crafting delicious wines from certified organic grapes. 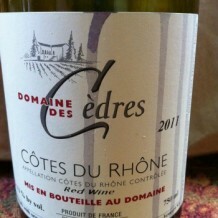 This week’s organic wine pick is 2011 Domaine des Cedres. It is a lovely red Côtes Du Rhône (a sassy, juicy blend of Grenache, Syrah, Carignane and Cinsault), priced at only $15 per bottle – an extraordinary bargain, in my humble opinion. This wine is what we would call “a total fruit bomb” here on Planet Wine Wench. It is loaded with aromas and flavors of ripe raspberry, red cherry, violets, wildflowers and peppery spice, all wrapped up in a silky, medium-bodied mouthfeel. Buy some. Buy some now! Contact www.theorganicwinecompany.com for more details and availability.